Rolls-Royce Motor Cars Chief Executive Officer, Torsten Mueller-Oetvoes, has announced that the current Phantom will enter the last stages of its celebrated life in 2016. This announcement follows the recent news that Rolls-Royce Motor Cars has begun testing its all-new aluminium architecture, which will underpin every future Rolls-Royces arriving in-market from early 2018. He also announced that Phantom Coupe and Drophead Coupe models will not be renewed in the future. These two magnificent Phantom models will end their lives with a special collection of only 50 highly desirable cars to be called Phantom Zenith. The current seventh generation of Phantom started production in Goodwood over 13 years ago and quickly became the foundation upon which the renaissance of Rolls-Royce Motor Cars was built. Now the Phantom VII is now approaching the end of its life. During November this year the build of the very last Phantom Coupe and Drophead Coupe at Goodwood will be completed. These models will not be replaced. Collectors around the world will be excited to learn that a spectacular collection of 50 unique Coupes and Dropheads, called Phantom Zenith, will be built to celebrate the end of production of these truly exceptional cars. To mark their exit, Rolls-Royce Motor Cars’ Bespoke design department will create the most highly Bespoke examples of each Phantom model to date – Coupe, Drophead Coupe and Limousine. At the same time the craftspeople who build each Rolls-Royce motor car to roll down the line at the Home of Rolls-Royce at Goodwood are already preparing themselves for the painstaking work that will go into these very special final motor cars. 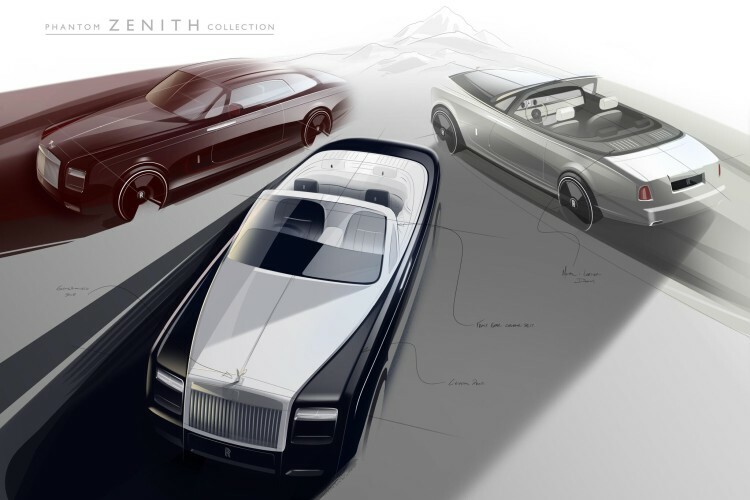 The first of these special collections will be named Zenith, and will be the last ever Phantom Coupe and Drophead Coupe models available to commission from Rolls-Royce Motor Cars. Such surprise features will include a Tailgate Hosting Area; laser etched armrests depicting the original launch locations of 100EX in Villa D’Este and 101EX in Geneva; Bespoke instrument dials and a special treatment of the iconic Spirit of Ecstasy figurine. Each customer will also receive a ‘money cannot buy’ portable memento of his or her purchase, whilst the motor cars will be offered to clients in a palate of memorable color combinations from Rolls-Royce’s history.